A scheme that aims to ensure nobody is forced to sleep on London's streets for more than one night has been announced. The Department for Communities and Local Government will spend £710,000 on the No Second Night Out project. The scheme will be trialled in London for a six-month period from April 2011. London Mayor Boris Johnson said: "The fact that people still endure Dickensian conditions on the streets of 21st Century London is scandalous and something I am committed to ending." The project will be managed by the London Delivery Board, a body set up by the mayor in February. 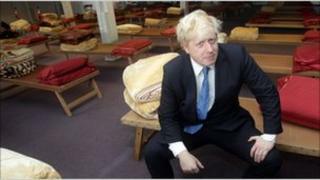 Mr Johnson has set a target to end rough sleeping in the capital by the end of 2012. Homeless charities Crisis and St Mungo's have representatives on the London Delivery Board. The mayor visited a specialist centre on Monday for rough sleepers run by the charity Crisis. It will open its Crisis at Christmas centres on 23 December for eight days. It expects about 2,500 homeless people to visit its centres to access vital services over the Christmas period. Do the homeless cope in the cold?